Girls' Generation made their departure at the San Francisco International Airport on May 22, 2012. Sooyoung (수영) was once again seen in a stylish outfit. Sooyoung (수영) opted for a maxi dress and leather jacket from Theysken' Theory Resort 2012 collection. Keeping it casual with a pair of sandals and Proenza Schouler 'PS1' satchel bag. 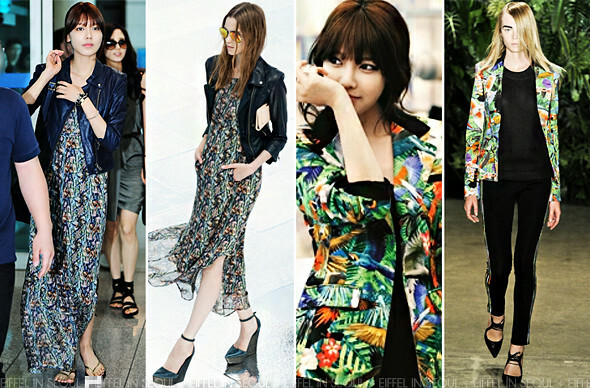 She was also photographed in a printed blazer from Altuzarra Spring/Summer 2012 for Star1 magazine. Unfortunately, there isn't a full-length photo of her but I absolutely love the blazer on her.